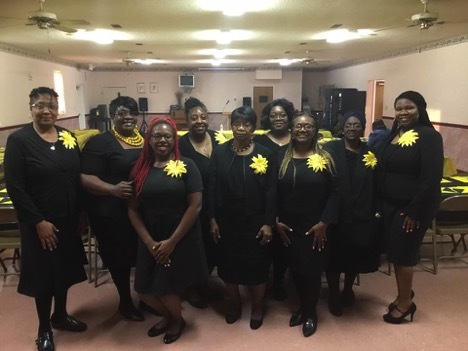 The Friendly Hospitality sponsored a program on March 28, 2019 that was a little different from most programs. Spearheaded by Missionary Rosa Sharpe, the president of the Hospitality Unit, the church was invited to a Spaghetti Dinner program. Decorated in black and yellow, the fellowship hall was inviting to everyone. The theme was Christian Hospitality supported by Romans 12:13 and Hebrews 13:2. Sister Melaine Thomas was the presider for the night and encouraged the audience to participate in a quiz on the back of the program, “How well can you set this table?” There was a place for the informal setting and the formal setting. The items for the settings were at the bottom of the program. The answers were to be given after the service. After prayer, scripture, and welcome, a spaghetti dinner was served. Though the dinner was delicious, the word of God was shared by Missionary Vanessa Wilson of Old Time Way of Augusta, Georgia. She was dynamic in her invitation to be hospitable. At the end of the service, thank you notes gave the correct setting for formal and informal dinner. This was different from the regular Thursday night service. Everyone enjoyed the food and the Word. Everyone will also be looking forward to this program again next year.